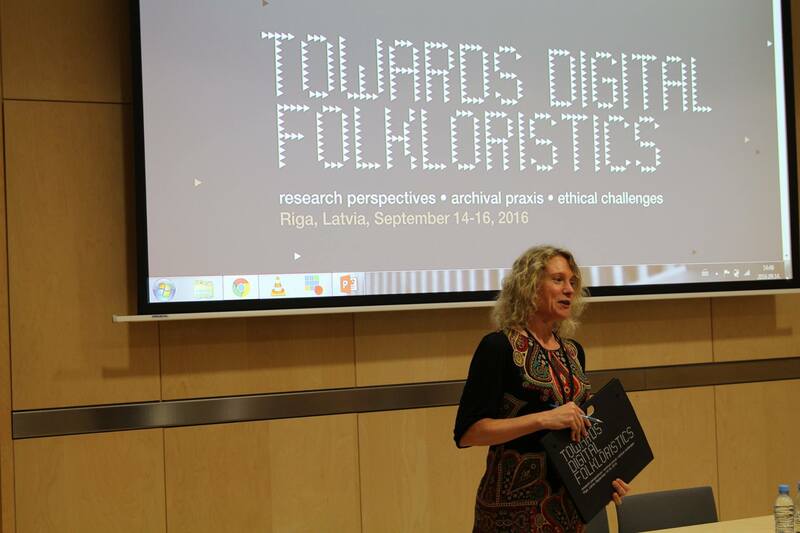 From 14 to 16 September 2016 the Archives of Latvian Folklore of the Institute of Literature, Folklore and Art, University of Latvia held the scholarly conference Towards Digital Folkloristics. Research Perspectives. Archival Praxis. Ethical Challenge. This conference was devoted to the digital folkloristics — a field that has developed at a significantly fast pace during the recent years. With the information technology having become an integral part of our everyday life, folkloristics — the same as other fields of humanities, experience an interdisciplinary "digital turning point", allowing to diversify the field of research. In folklore archives and other culture heritage institutions use of information technology has developed much further than mere creation of digital copies and catalogues. Digital platforms, tools and methods aimed at collection, processing and study of folklore, as well as the ones facilitating communication with the users of folklore archives, have substantially influenced the environment of the folklore archives. There were participants from 19 countries presenting their papers — from Latvia, Estonia, Iceland, Canada, Russia, The U.K., Lithuania, Germany, Sweden, Norway, Poland, Finland, Hungary, Belarus, Ireland, Romania, France, Japan and Panama. The presenters discussed a wide range of matters related to digital folklore archives, virtual communities, social networks and virtual participation practices in the field of traditional culture. The conference became an important milestone in the international discussion of the situation of the field and the need for closer collaboration, that will be continued next year. On the third day of the conference the meetings of the Archives Working Group of the International Association for Ethnology and Folklore (SIEF) and Network of Nordic-Baltic Tradition Archives, bringing representatives of many European archives to the Archives of Latvian Folklore. The conference was organised by the Archives of Latvian Folklore in collaboration of SIEF Working Group on Archives and the Network of Nordic-Baltic Tradition Archives. The conference was supported by the Nordic Culture Point and the Ministry of Education and Science of the Republic of Latvia (budget subprogramme 05.04.00 "The cabinet of Dainas of Krišjānis Barons "), together with the EUSBSR Seed Money Facility project “Connecting Digital Archives of Intangible Cultural Heritage”.